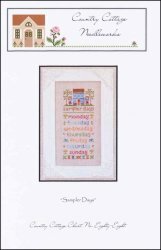 Sampler Days [E8788] - $8.50 : Yarn Tree, Your wholesale source for cross stitch supplies. Two girls are standing in the front yard by a blue house. Colorful flowers, blue birds, and bobbins of thread accent the design. Below the house are the words Sampler Days and the days of the week. Stitch count 61w x 142h.